Do you love mathematics? Are you aware that there are many amazing features of Vedic system which complements conventional math? In today’s time, Vedic math presence is growing in Education field – not only in India but worldwide, and attracts people’s attention due to its unique features. Below are top features of Vedic Math’s, which going to help you why you should study and encourage people to study Vedic math? Logic – Well, the most unique feature of the Vedic system is its logic. The whole Vedic system is beautifully consistent and combined: the simple squaring method can be reversed to give one-line square roots and the multiplication method, is easily reversed to allow one-line divisions. Easy hah? Simplicity – This is one of the prominent features of Vedic math. If you are doing calculation through the modern method, it will complete in 4 or 5 steps but in Vedic calculation method, you will get the result in just one step. Apparently, it saves your time and increases your productivity. We simply subtract each digit in 357 from 9 and the last digit from 10. Encourages creativity – All the features of Vedic math encourage people to be creative in mathematics. Being naturally creative people like to devise their own methods of solution. Improve Memory and Concentration – Almost all the calculation is done without pen and paper and it will certainly improve the memory and concentration of the student. Appeals to everyone – The Vedic system appeals to everyone; all age groups. The professional one loves the choice to experiment and the less experienced prefer to stick to the general methods. Some love the opportunity to invent and have their own unique input, while others enjoy the challenge and solution of multiple methods. Increases mental agility – Vedic system uses logical-easy methods of mental calculation. This naturally develops the mental agility. And in turn results in growth in other subjects. Competent and fast – In Vedic math huge calculation or difficult problems can be solved instantly. These amazing methods are far more systematic than the modern ‘system’. Easy and fun – The experience of the joy of mathematics is an immediate and natural consequence of practicing Vedic Mathematics. And this is the true nature of maths – not the boring and rigid method that is currently widespread. Are you ready to learn Vedic math’s after knowing its amazing features? Well, learn Vedic math from a Government Certified Institute – Indian Institute of Vedic Math and Abacus (IIVA). 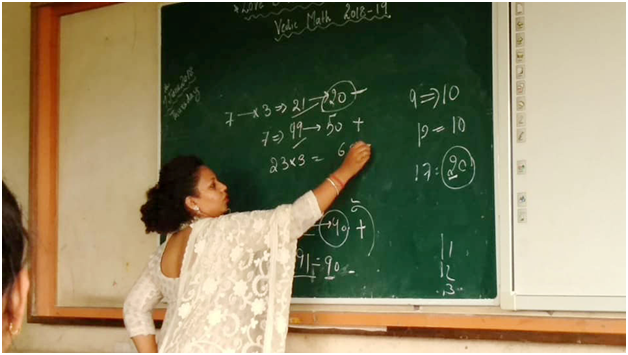 IIVA provide both online and offline Vedic math course. More importantly, this Government certified courses will benefit in fetching employment. The candidates pursuing BED/NIT/IBT/etc can benefit immensely from this course, as they will get more preference over others in a competitive employment scenario.